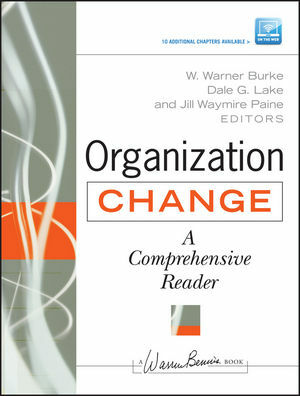 This volume contains the must reads for a depth of understanding about organization change. Each of book's seventy-five papers included in this volume have launched their own fields of inquiry or practices and are the key readings for any student or practitioner of organization development. The most notable articles on organization development by such luminaries in the field as Bennis, Schein, Tichy, Tushman, Weick, Drucker, Quinn, Beckhard, O'Toole, Bridges, Hamel, Gladwell, and Argyris. W. Warner Burke is Edward Lee Thorndike Professor of Psychology and Education at Teachers College, Columbia University. Dale G. Lake has worked as a consultant to more than fifty organizations including General Electric, Acco, AMOCO , HUD, Master Card International, Citicorp, and Conagra. Jill Waymire Paine teaches organizational psychology at Teachers College, Columbia University, and has worked as an organizational development consultant in a variety of for-profit and not-for-profit organizations.